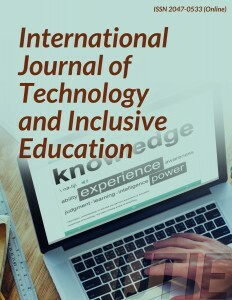 The International Journal of Technology and Inclusive Education (IJTIE) is a forum for electronic peer-reviewed journal and open-access of high-quality scholarly papers. The scope of IJTIE encompasses all aspects of educational technologies and inclusive Education. The paper submissions, peer review process and publications in the IJTIE are free (no fees apply). Authors retain the publishing rights without restrictions. The objectives of IJTIE are to provide an opportunity for academicians and professionals from various educational fields with cross-disciplinary interests to bridge the knowledge gap, promote research esteem and the evolution of technologies and inclusive Education. The IJTIE invites research papers that encompass conceptual analysis, design implementation and performance evaluation. Impact Factor (IF): 7.858 The IF is calculated by Infonomics Society’s Indexing Citation Board (ICB).